Nearly 4,000 rally attendees gathered at Osceola Heritage Park in Kissimmee for Bernie Sanders' campaign rally. “To paraphrase Abraham Lincoln ... this is a campaign of the people, by the people, and for the people,” Democratic presidential candidate Bernie Sanders said to nearly 4,000 rally attendees gathered at Osceola Heritage Park in Kissimmee Thursday afternoon during a campaign rally. As the hot Florida sun beat down on them, young, old, black, white and Latino supporters for Sanders held up their blue signs which read "A Future We Believe In," the hopeful words of Sanders’ campaign slogan that has inspired talk of a political revolution that will change everything. After the crowd's enthusiastic chants of “Bernie” finally subsided, Bernie introduced his campaign speech by emphasizing how his campaign differs from the usual presidential campaigns Americans see every four years. “This campaign is a different type of campaign, and the reason for that is we’re doing something very radical. We’re telling the American people the truth,” Sanders said before stressing the importance of working together to transform the country. Sanders then touched on the issue of raising the minimum wage to $15 an hour, asserting that “people cannot make it on 8, 9, 10 bucks an hour” in Disney World or anywhere in America. 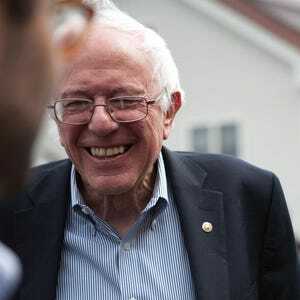 Afterward, Sanders assured his supporters that his campaign listens to senior citizens, young people, veterans, Mexicans, women, the African-American community, the Latino community, and even the oft-forgotten Native American community, who, he said, we owe so much to. Sanders made it a point to repeatedly highlight that his campaign works to improve the lives of everyone indiscriminately and does not operate on bigotry and intolerance, a remark referring to Donald Trump’s campaign, which often sees accusations of racism and sexism. Among the various proposals Sanders brought up, chief among them were his popular suggestions to make college tuition free, to give everyone the option to refinance their student debt to one with the lowest interest rates, to increase the annual amount distributed to individuals on social security, to offer a guaranteed three months of paid family leave, universal health care, a path to citizenship via comprehensive immigration reform, to actively respond to the global crisis climate scientists warn of and overturn the infamous Citizens United Act. Prior to hearing about Sanders' campaign. Elysia Griffin, 25, had never been involved with anything political, but, today, she worked as a volunteer in Sanders' campaign rally. Griffin said she doesn’t trust Democratic front-runner Hillary Clinton because, after watching her facial expressions and how Clinton answers questions, she came to the conclusion that Clinton seems very disingenuous. Griffin, a small-business owner of Filipino ethnicity, also said she supports Sanders’ call for Democratic socialism in America because she believes socialism can work so long as it has its foundation in democracy. She believes people who immediately think socialism is evil are just not educated enough on the subject. Trygve Nelson who works as a server at Universal Citywalk supports Sanders because he hopes Sanders' proposed plan to make college tuition free and provide everyone health care would help him and his girlfriend when they get off their parents’ heath care plan and enroll in college. Both Nelson and his girlfriend Kaila Olsen attended a Donald Trump rally earlier to see what his platform was about without any media bias. However, Olsen was unimpressed by Trump’s speech. Sanders’ win in Michigan has bolstered the faith of his supporters regarding Sanders' chances of winning the Democratic primaries. “I think that the Michigan primary the other day was a pretty good example of how he can come back and how all the volunteers and the canvassers have really helped and done a lot, and it’s kind of showed that he can win,” Nelson said. The surprising win in Michigan, due to a record-breaking turnout, also seems to have given him confidence that he has a chance of winning Florida as well, as long, he said, as voter turnout is as high as it was in Michigan and people believe that the current, unsatisfactory status quo can truly change following a political revolution.